Watch our African penguins frolic, swim, and nest on three live webcams. Native to the coasts of South Africa and Namibia, these flightless birds have an important conservation story to tell. Tune in at 10:30 am and 3 pm daily for a live feeding demonstration with our penguin biologists. On January 24, Stanlee made made her official debut in the African penguin exhibit! Keep an eye out for the cutie sporting a teal band on her left wing. Learn more about Stanlee. Stanlee gets a scratch. She'll sport this downy "fluff" for a few months before growing in her swim feathers. When you eat 10% of your body weight 2-4 times per day, who has time to chew? It may be the waddling. Or their sophisticated tuxedoes. Or perhaps it's the fact that they are highly social and form long-term bonds. Whatever the reason, penguins have a knack for capturing our hearts. The Academy's colony of African penguins (Spheniscus demersus) does just that, while helping educate thousands of visitors a day about their fascinating biology and plight in the wild. Each bird in the exhibit wears a colorful wing band, which helps Academy staff and visitors quickly distinguish one bird from another. Males are banded on the right, females on the left. Couples, which typically have the same colored wing bands, can often be seen grooming one another near the nest box they share. Scuffles over territory are common, and there is a definite social hierarchy within the colony. Through pointing (when a penguin lowers its body to the ground and point its beak at another penguin), biting, fighting and braying, dominant birds (usually older) establish a pecking order, and will literally put a juvenile bird in its place by chasing or herding if they feel challenged. African penguins feed on anchovies and sardines in the wild, and we simulate their diet at the Academy by offering sustainably caught herring and capelin, supplemented by vitamins, including B-1, E, and a multi-vitamin. At every feeding a volunteer records what each bird eats, gathering data which helps biologists monitor the well-being of each individual. The Academy exhibit closely mimics the penguins' natural environment through both its physical variability and changing climatic conditions. The physical features of the exhibit—water, rocky shore, cozy burrows—encourage the full range of penguin behaviors, and through sophisticated use of light and temperature controls, Academy penguins experience sunrise, sunset, and everything in between. Water and air temperatures in the exhibit also change to mimic natural seasonal cycles. Though the Academy's penguin colony is healthy and growing, their wild relatives aren't faring as well. Based on major population declines (at least 90 percent over the 20th century), African penguins were designated as an endangered species in September 2010 by the IUCN and the USFWS. In 1930, there were roughly a million of these charmers in their native West African habitat, but penguin biologists now estimate that there are only about 25,000 African penguin pairs remaining in the wild. Penguin experts believe that commercial fisheries are largely to blame for the decline - fisheries continue to draw down stocks of the fish that African penguins consume, leaving them with an increasingly empty pantry. Climate change and shifting ocean currents are also causing the penguins' preferred prey species to move, making it harder for the penguins to find them. The waters off South Africa contain major shipping lanes, and oil spills are frequent and deadly for African penguins. SANCCOB, the Southern African Foundation for the Conservation of Coastal Birds, is the biggest rehabilitation center in the region, and responsible for successfully rehabbing tens of thousands of penguins affected by spills. The good news is that African penguins are finding a strong ally in the Species Survival Plan (SSP), a program sponsored by the California Academy of Sciences and 53 other zoos and scientific institutions in the U.S. and Canada. The SSP's goal is to ensure the long-term survival of a viable population of African penguins. 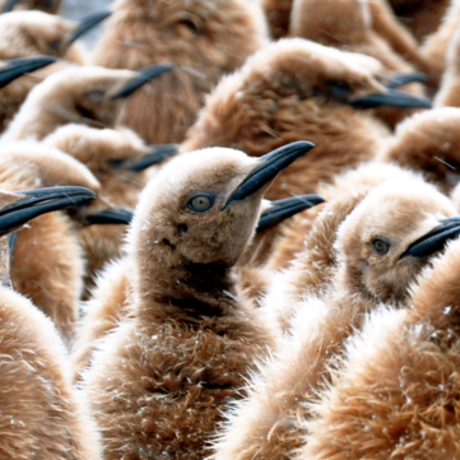 Since 1983, numerous chicks hatched at the Academy have moved to other zoos and aquariums around the country in order to maximize long-term genetic diversity in the captive-bred population. That population acts as a reservoir for genetic diversity, and could eventually be used to bolster wild penguin populations. Breeding pairs in the wild dig burrows in guano or sand, or build nests under bushes and boulders, but past guano collection by people has made suitable burrow territory harder to come by. Conservation efforts in Africa include ongoing monitoring of population trends, and introducing artificial nesting structures. Additional research is needed on the impacts of fishing and predation, reintroduction and translocation techniques, and shifts in penguins' food sources. There is never a dull moment in the penguin exhibit. Watch for these commonly seen behaviors and processes that offer a window into penguin biology and their complex social interactions. In order to stay warm, a penguin must constantly work to keep their feathers clean, well-oiled, and waterproof. This behavior is called preening, and can be done while swimming or on land. Penguins have an oil gland at the base of their tail, and nip at it to transfer the oil to their beak, so they can apply it to the rest of their body. These behaviors begin during courtship when a new couple is getting to know one another. Throughout their relationships, which can last a lifetime, partners will continue to bow and shake their heads at one another to reinforce their bond. When moving through the territory of other birds, African Penguins adopt a slender posture in which the body is stretched vertically, and the neck is elongated and the head held high. By moving in this manner, the penguin signals to other birds that it is not a threat and need not be pecked. You can watch our penguins exhibiting this behavior when walking on land and approaching a nest box. The most common and loudest behavior of the African Penguin is the ecstatic display, seen and heard every day in the exhibit. Standing with its feet apart, a penguin slowly raises its head, pointing the beak upwards. Wings lifted outward, the chest heaves with an inhale of air, followed by a loud braying sound. This display is most frequently seen and heard when a penguin has wandered into another’s territory. 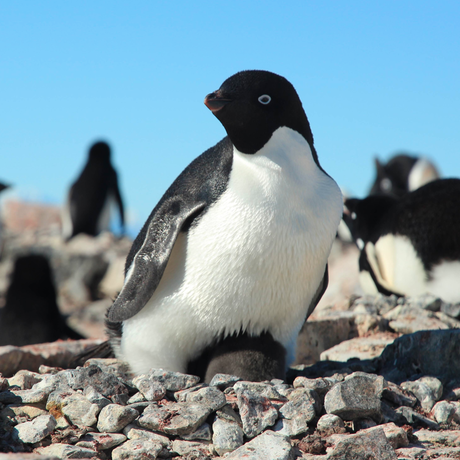 It communicates territory ownership, identifies the penguin (each bird’s bray is unique) and often draws the mate back to their territory. Penguin feathers are highly adapted to provide insulation, but they wear down over time and need to be replaced. About once a year, each bird goes through a molting process which takes weeks to complete. New feathers are manufactured beneath the skin and essentially push the old feathers out as they grow in, causing the birds to appear quite disheveled. In the weeks leading up to molting, a penguin will eat more than usual to bulk up for an extended period of time out of the water. In our exhibit, biologists feed molting birds on land, but in the wild, this would be a time period without food. Can't travel to Golden Gate Park? Your class can interact with our exhibits, animals, and experts in a live stream via our Distance Learning programs.